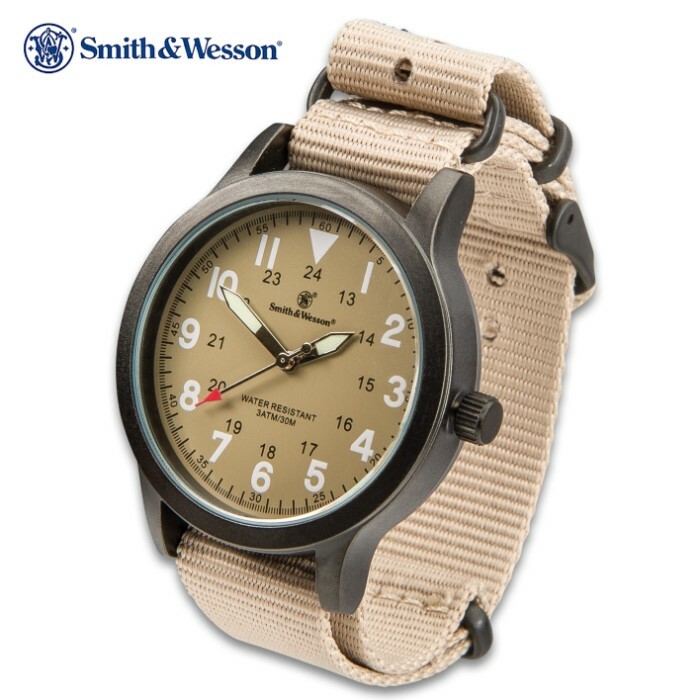 Smith & Wesson NATO Wristwatch - Canvas Band - Tan | BUDK.com - Knives & Swords At The Lowest Prices! 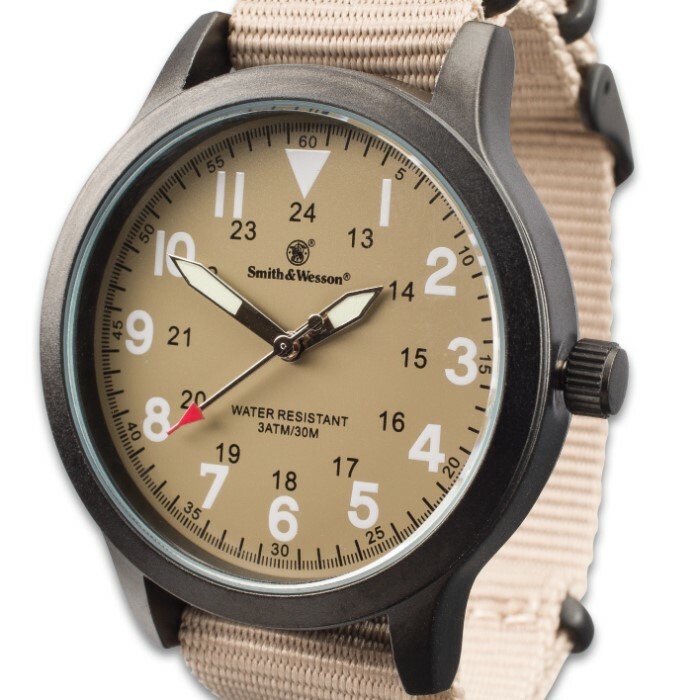 The Smith & Wesson NATO Watch is a great everyday timepiece that can take the abuse of the daily grind and then some. 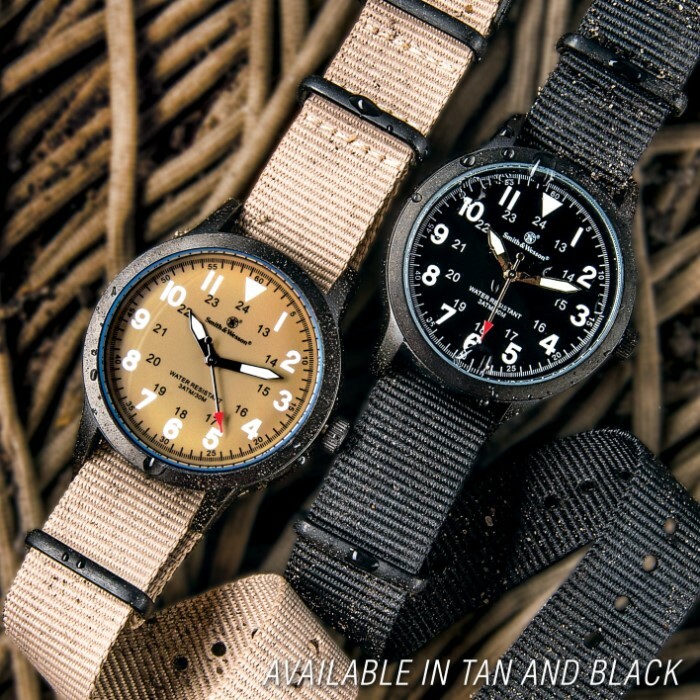 Water resistant up to 30m, it's perfect for wet and wild outdoor adventures - rafting, swimming, fishing and more! 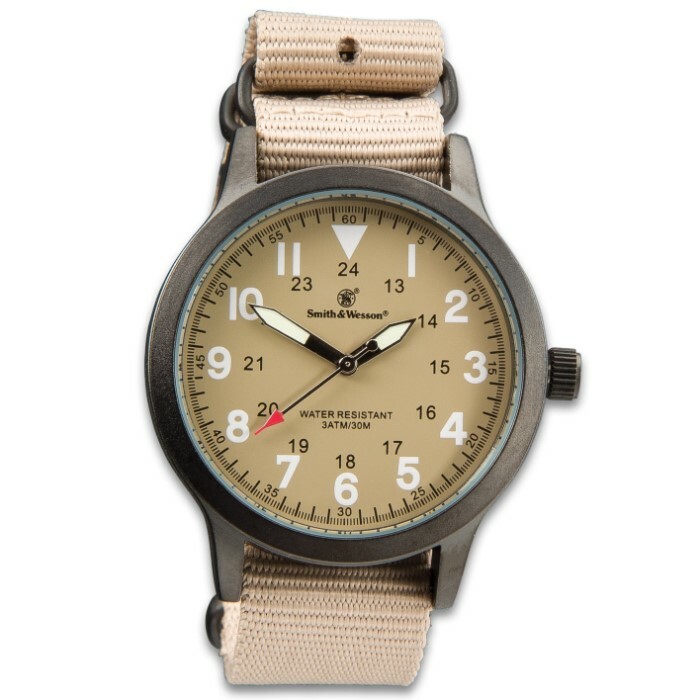 Precision Japanese quartz movement ensures reliable timekeeping, and the durable canvas strap provides style, comfort and a secure fit. And thanks to our exclusive low price, you won't find a better deal on this exceptional wristwatch anywhere else! From revolvers to wristwatches, when you're looking for reliability, Smith & Wesson always has you covered. And when you're looking for unbeatable value, look no further than right here! I needed something for work that I wasn't afraid to get dirty, wet or damaged. This works very well and is easy to clean and the price is reasonable so if I damage it I'll just order another. Nice watch for the price. I don't care for the huge watches that seem to be the norm today. This watch is a perfect size and weight. Like the band. If you have large wrists though this watch probably is not going to fit you well. Seems to be well made and though I haven't ordered any there seem to be tons of bands on Amazon that will fit it if you don't like the one it came with. The watch it self is smaller then I had imagined but it's an awesome, durable watch. A great gift from my girlfriend!